Lately I’ve been on Black and Tan kick. A Black and Tan is a bar drink that’s made with half stout (usually Guinness) and half lager (usually Harp). 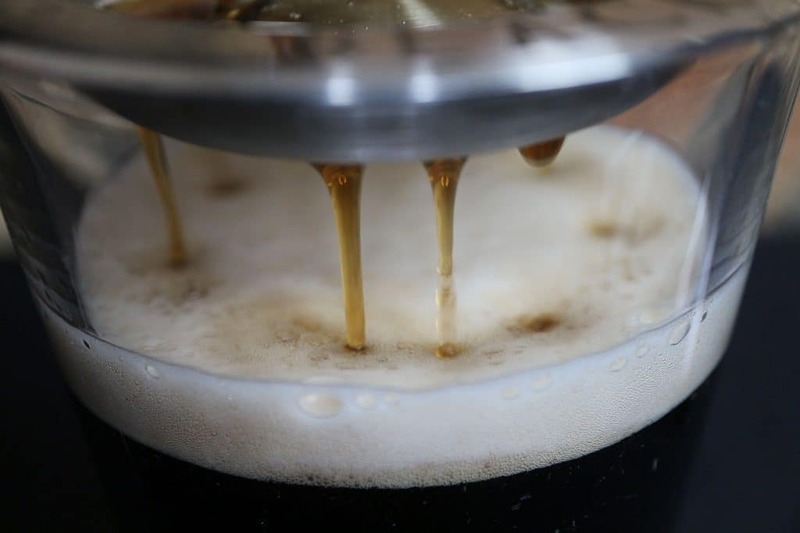 The lager goes in the bottom of the pint glass and the stout is layered and floats on top of the lager. There’s another “Guinness cocktail” made with hard cider that’s called the Snake Bite. Now there’s a lot confusion and rumors out there when it comes to the Snake Bite Drink and I’m going to try to clear them up. 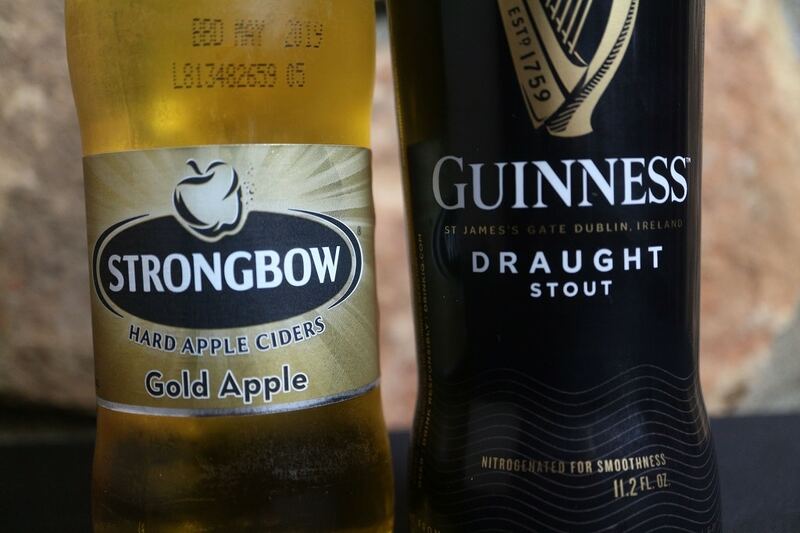 Now here in the United States, a Snake Bite drink is half Guinness Stout and half hard cider. In Great Britain, a Snake Bite Drink is traditionally made with half lager and half cider and then they splash it with a black currant cordial. Pubs didn’t always have the black currant cordial so they often served it without the dash of black currant cordial. This became so common that it was the accepted way to serve it. So if you wanted a Snake Bite the traditional way, you’d have to ask for a Snake Bite and Black. 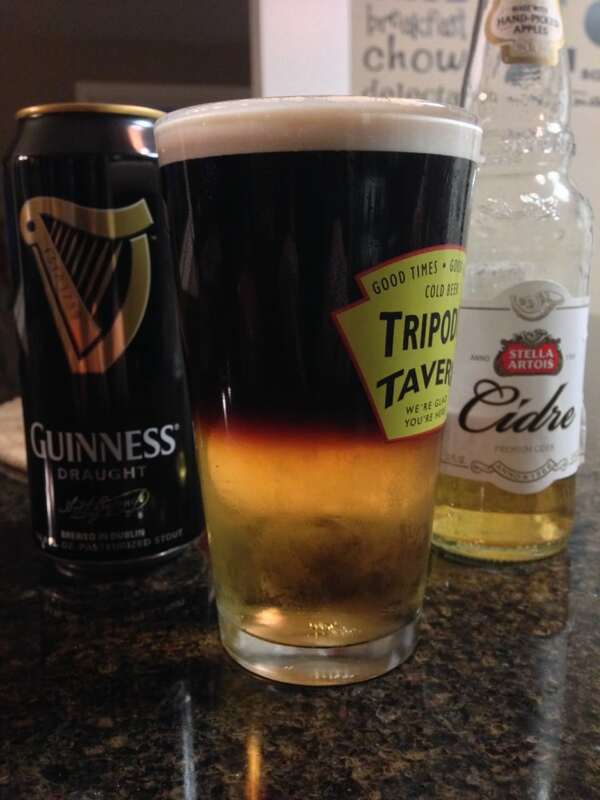 There’s so many other layered beer drinks made with Guinness that it’s pointless to ask for them by name. Everyone has their own version of the variations that you’ll never get the same drink twice. Get a different bartender at the same bar and you’ll likely get a different drink. You pour the hard cider into the glass first. Then you slowly pour the stout over the back of a spoon so that it’s drips down the side of the glass and sits on top of the cider. I’ve also seen some bartenders pour the Guinness using a knife. Both of these methods will take some practice. A some pubs you’ll even see the bartender use a bent spoon so that the back of the spoon can sit level lower in the glass. Beer science at it’s best. But if you’re out of practice pouring over a spoon like I was, then you need one of these The Perfect Black and Tan Beer Layering Tool. It’s a stainless steel disc with holes in it that make pouring a Snake Bite or a Black and Tan really easy. 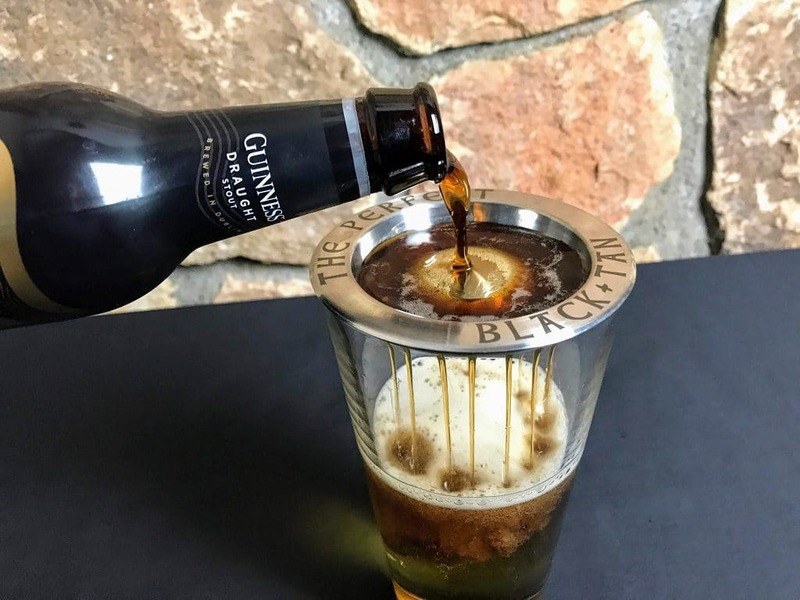 If you can pour slowly, then you’ll be able to make perfect Guinness Cocktails with this device. 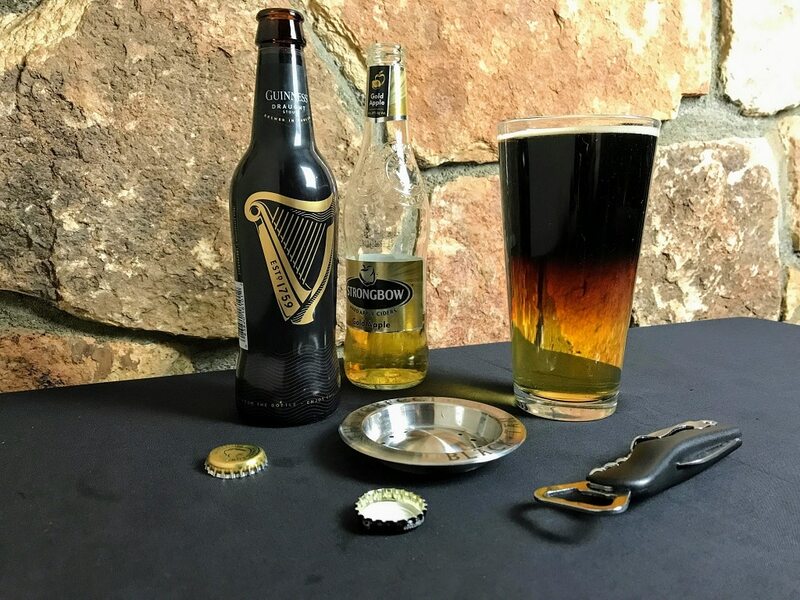 Check out my YouTube video to see how to use the Perfect Black and Tan Beer Layering Tool. Definitely turns making a black and tan or snake bite drink into a no skill required event. They say that the Snake Bite drink is the poor man’s version of a Black Velvet (which is a stout and champagne). Snakebite and Black is the drink I described above that includes the splash of a black currant cordial. This drink can also be called a Diesel. Do you mix a snakebite? No, why would you bother to layer it if you’re going to mix it? If it mixes up on its own while you’re drinking it, that’s no big deal. Definitely don’t ask for a new one, they’ll laugh you out of the bar. But don’t mix them up on purpose. Is the drink snakebite illegal? There’s a rumor that the Snake Bite drink is illegal in the UK. It actually is not illegal but many bar owners choose not to serve this drink because people tend to over indulge because it’s tastes so damn good. Also adding to the rumor that the Snake Bite is illegal is Bill Clinton. In the early 2000s, the former president visited the Old Bell Tavern in Harrogate, England. The rumor is that he asked for a Snake Bite drink and was refused because the owner thought it was illegal to serve them in the UK. So when this story was reported on by the media, it added to rumor that the snake bite was illegal. The actual story seems to be that Bill Clinton ordered a Diet Coke and one of his security team ordered the Snake Bite but it’s too late for facts now. So is the Snake Bite Illegal? No, the Snake Bite is not illegal. Feel free to enjoy either the US version with Guinness or the UK version with lager with no fear of because arrested.